MSNBC host Katy Tur suggested Thursday that it does not matter whether Robert Mueller's investigation finds evidence of direct collusion between Donald Trump's presidential campaign and Russia because the special counsel has already uncovered "quite a bit" of dirt on the president. 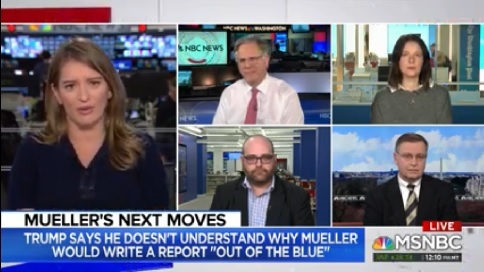 "Let's just put on the screen everybody who's been found guilty or already indicted in the Mueller investigations. Lots of faces, lots of pleas, and lots of indictments," Tur said, pointing out that Trump affiliates such as Michael Cohen, Paul Manafort, and Michael Flynn have been found guilty of various crimes. "They've already come up with quite a bit, regardless of whether or not there is direct collusion or conspiracy found between Donald Trump and his campaign, and the Russians," Tur added.